Hackney has welcomed the first in a series of contactless donation points designed to help London’s homeless. The terminals, run by TAP London, a non-profit founded in Hackney in 2017, take £3 donations from contactless cards. All of the money raised is split equally among the 22 members of the London Homeless Charities Group. It is spent on providing essential services across the capital, helping rough sleepers to cope with the day-to-day but also to forge a path away from life on the streets. 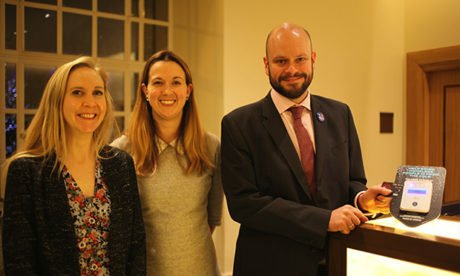 Mayor of Hackney Philip Glanville joined finance chief Cllr Rebecca Rennison and community safety boss Cllr Caroline Selman to unveil the first three terminals. They can be found at Hackney Town Hall, Hackney Service Centre and Climpson & Sons Café on Broadway Market. More points are to be rolled out in the next month, following a request from the council. Mayor Glanville said: “In an age where people don’t carry change, but still want to help make a change, these donation points are crucial so everyone can do their bit to help tackle homelessness. “The council is doing all it can to help, but ultimately we need the government to make changes nationally that address the root causes of homelessness. TAP London co-founder Polly Gilbert said: “Since launching our winter campaign, we’ve raised over £34,000 from over 11,000 generous Londoners. If you are a business in Hackney that would like to host a TAP site, email info@taplondon.org.